The year has gone well as we have not yet heard anything explosive, and it’s gonna get better as Samsung is about to drop two new smartphones, The Samsung Galaxy A8 2018 version and its big brother Galaxy A8+. Samsung’s A Series is by definition the closest mid-range price smartphone with high-end class. This can be proved by the fact that the Koreans are providing this mid-range with an infinity display, which is also featured on Samsung Galaxy S8. This . The resolution of both the 5.6-inch A8 and the 6-inch A8 + remains below the Samsung’s flagship displays. Instead of 2,960 x 1,440 pixels you get here 2,220 x 1,080 pixels at a form factor of 18.5: 9. Not bad for a smartphone of this budget. The Super AMOLED displays welcomes your graze when you hold this beast. Coming back to the order of the day the most important specs are: 5.6-inch or 6-inch FHD display with a resolution of 2,220 x 1,080 pixels Exynos Octa Core SoC (2.2GHz Dual + 1.6GHz Hexa) 4 GB RAM (A8+ 4 or 6 GB RAM) 32/64 GB internal memory, expandable by microSD card up to 256 GB. Main camera is 16 megapixels with phase detection focus, Dual cam front: 16 MP + 8 MP, both with f / 1.9 aperture Android 7.1.1 Nougat 3,000 mAh battery (A8 + 3,500 mAh) fingerprint sensor Wi-Fi 802.11 a / b / g / n / ac (2.4 / 5GHz), Bluetooth 5.0, NFC, GPS, Glonass, BeiDou LTE, Cat 11 IP68-certified USB Type-C connector Dimensions: 149.2 x 70.6 x 8.4 mm (A8 +: 159.9 x 75.7 x 8.3 mm) Weight: 172 grams or 191 grams (A8 +). Anyone who has looked at the specs attentively will have noticed that both variants do not differ greatly from each other, apart from the size itself. Both offer the same display resolution, but due to the larger screen size Samsung donated the Plus model with a slightly thicker battery. The only difference beyond that is that the A8 has 4 GB of memory whereas the A8 + is available in both 4GB and 6 GB of RAM. You may have noticed in the technical data that 7.1.1 nougat is coming pre-loaded on this phone. Since both smartphones will be available in early 2018, Android 8 Oreo would have been much desirable option. It is also revealed that first, you get a dual camera setup on front, where you get the 16MP main camera and the second shooter of 8MP. On the back sits a simple 16 MP cam. On the other hand, it is noticeable that Samsung has fortunately positioned the fingerprint sensor differently. Like the S8 it sits on the back but now centrally placed under the camera for better reach. This is also pleasing for those of you who are already waiting for the Samsung Galaxy S9 as we expect the same placement of the fingerprint sensor for it…. 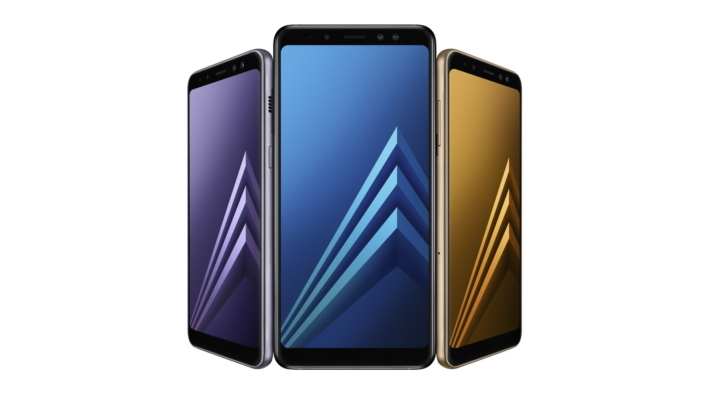 Here you can look at the metal backs again in peace – in all four available colors (black, blue, gold and orchid gray): The front is much more meaningful of the Galaxy A models, both models are also certified to IP68, so therefore protected from dust and liquid. Technically, this is very, very neat for a mid-range smartphone, except for the somewhat aged Android Nougat. Samsung itself does not gave a price yet, but we may or must assume that the fun starts at about only 45000 Rs. 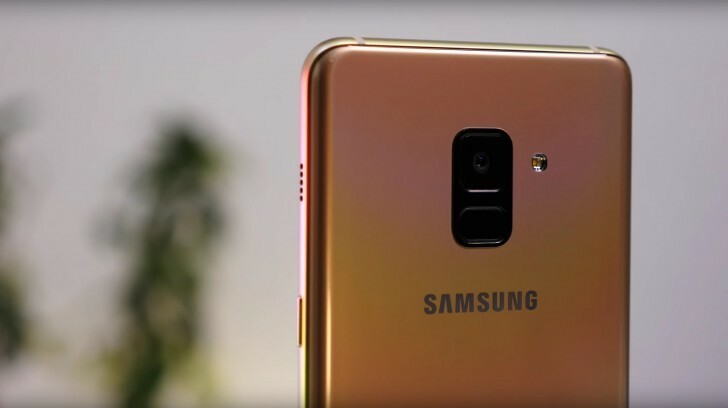 For a long time you do not have to wrestle with you when it comes to the purchase and the decision whether to get an S8, Samsung Galaxy A8 or possibly an Samsung Galaxy A9 soon. In addition, we will be adding further exciting new smartphone products in 2018 to our portfolio. Sure, with these two smartphones, Samsung runs the risk of cannibalizing itself with a flagged 2017 flagship and a successor that is almost at the doorstep. Until then we wait. © 2017 The Herald Pakistan, all rights reserved.